At Bled Bike Festival its our mission to energize people with our passion for biking both in and outside our fine event. We help every rider experience the joy and freedom of biking around Julian Alps, Bled and Slovenia. Whoever you are, wherever you live, we think the Bled Bike Festival will bring convenience and joy into your life. One of the largest bike festivals in the Adria Alps region. One of the most attractive and toughest mountain bike races in the Alps region. The largest bike expo in Slovenia and wider afield. Excellent, green and fresh festival content. Promotion of destinations and cycling opportunities in Slovenia. The bike festival that brings the local community together. Educational and sports content for children and adolescents. We are a small team, which passionately believes that biking makes the world a better place. We asked ourselves a simple question; why is this so, and what could we do about it? We learned that peoples’ time is important, that we love to be together and ride a bike. We’re proud to design Slovenia’s finest bike festival – by and for the people who love to ride bikes. We made a festival for people just like you, and we invite you to join us. 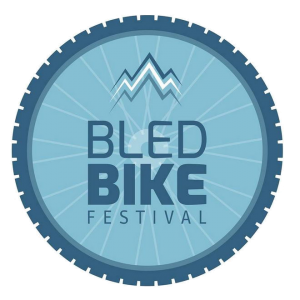 Our message is hidden in a logo of Bled Bike Festival and goes out to everyone. It is a message of bikers who love to bike, that the mighty Julian Alps are our playground and that we like to come together to bike, socialize and have a good time. The blue color is sending out the message of trust and the modern type tells we follow trends and needs of people. Slovenia is a unique destination for mountain biking and holidays. We are aware of the natural resources and the beauties of our land. That is why we have taken mountain biking and bike events seriously quite some time ago. We are present on the field in Slovenia more then two hundred days a year. There are no limits to our possible mountain biking tours and trails and we feel at home at any of them. We know Slovenia for bikers better than anyone. We make festival for people just like you, and we invite you to visit us.